Is your piano out of tune and in need of a specialist? 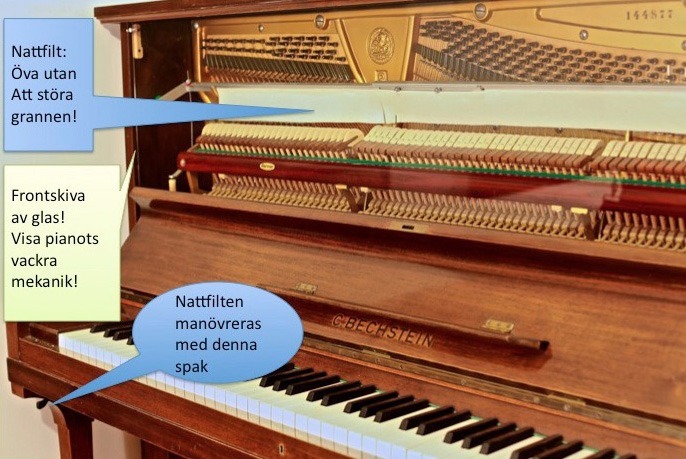 My name is Hans Vesterberg and I work as a professional piano tuner in Stockholm. I live at Liljeholmen in Stockholm. I tune pianos, grand pianos (making concert tunings) and harpsichords throughout Sweden. I make tuning by ear or with a digital tuner according to my customers’ requirements. I also do complete mechanical adjustments and intonation of all upright, grand pianos and also harpsichords. I’m specially trained in mechanical adjustment for Steinway grand pianos. And for upright pianos – Yamaha models are my speciality. Besides this, I install air-conditioners for grand and upright pianos. The brand name “Piano Life Saver System is designed to maintain constant humidity in direct proximity to the soundboard of the instrument. The instrument’s mechanics and soundboard are protected and as a bonus – preserves the mood of the instrument. I also mount and repair piano legs with wheels and brakes if you require this in your home. Need to practice piano without disturbing anybody? Get a ‘night blanket’/mufler on your piano. I sell and also install them. I also repair minor problems such as sticking keys, lack of pedal function and I replace complete sets of tuning pins with complete string change. Just call me if you need my services, or call for more information in detail. Mobile number: 070-604 72 06. A tuning takes about 1,5 hours depending on how out of tune the instrument is from the beginning. Read more about Piano Life Saver System. Kungsholmen, Norrmalm, Södermalm, Östermalm, Djurgården, Enskede-Årsta-Vantör,Farsta, Hägersten-Liljeholmen, Skarpnäck, Skärholmen, Älvsjö, Bromma, Hässelby-Vällingby, Spånga and the whole of Stockholms County.